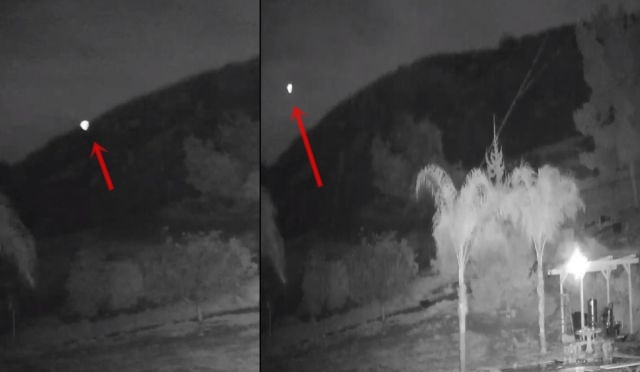 A security cam has recorded a strange triangular light anomaly that suddenly appears on the slope of a hill in Simi Valley, California. Then the anomaly moves upwards away from the hill. The owner of the security cam said: It rained last night 3/5/19 at 7:30 pm. This is my backyard camera facing south/west in Simi Valley, Ca. This is the night we had a big thunder and lightning storm. Look on the left behind the hill and you will see the light come up. Weird shape and not a plane. Planes are a small dot. A plane that low would be crazy flying around in a lightning storm. The camera time posted is not correct. I never set it. I got the time off my Blue Iris program.